As it does every year, Apple on Wednesday began preparing its brick and mortar stores for Earth Day, which falls on Saturday, April 22, by changing the leaf of its familiar illuminated logos green. 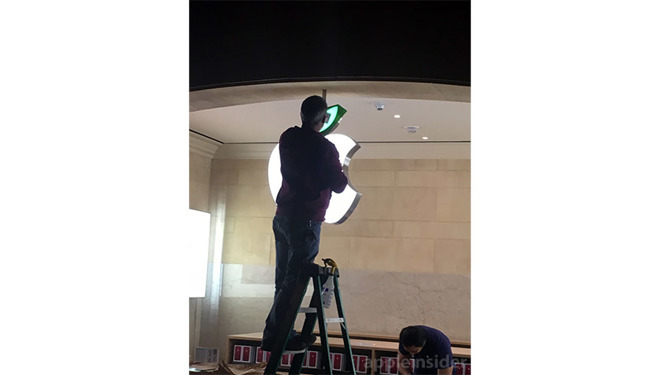 As seen in the photo above, taken at the Grand Central Station Apple outlet in New York City, Apple has overnight crews updating store signage to reflect the company's annual observation of Earth Day festivities. Like the red versions installed for World AIDS Day, the green leaf logo swap has become something of an annual tradition for Apple. Along with the change to store signs, employees are expected to don green shirts and specialized name tags starting Thursday. In years past, Apple has taken Earth Day as an opportunity to highlight its corporate conservation efforts. Last year, the company aired a pair of commercials featuring its clean data centers and Liam iPhone disassembly robot, and launched an "Apps for Earth" promotion on the App Store. The latter campaign, which is also expected to repeat this year, saw Apple partner with 27 popular apps to donate App Store earnings to the World Wildlife Fund. Apple has yet to release an Earth Day ad for 2017, but the company earlier today announced a special fitness challenge for Apple Watch owners. Similar to Apple's Thanksgiving holiday and New Year challenges, the Earth Day event urges users to complete a 30 minute workout on April 22. Those who manage to complete the task will receive a special Activity badge and corresponding stickers for use in iMessage. To coincide with this year's eco-friendly branding, Apple on Wednesday released its 2017 Environmental Responsibility Report, which notes continued advances in renewable energy and material use. Perhaps more importantly, Apple Vice President of Environment, Policy and Social Initiatives Lisa Jackson in an interview with Vice said the company plans to make future products out of 100 percent recycled materials in a closed loop manufacturing process.